This year, Toyota simplifies the Venza’s powertrain offerings, adds a standard reversing camera, and introduces new versions of its Entune infotainment technologies. Models with a V-6 engine also get a standard Towing Prep Package for 2015. For 2015, the Toyota Venza is available in LE, XLE, and Limited trim levels. By upgrading to the Venza XLE, buyers gain leather seats and interior trim, heated front seats, memory for the driver’s settings, and a power adjustable front passenger’s seat. Additionally, this model includes Smart Key passive entry with push-button engine starting, an anti-theft system, and power folding side mirrors with a reverse tilt-down feature. A Premium Package adds a power sunroof, a panoramic glass roof, and a premium audio and navigation system with Entune App Suite to the XLE model. These features come standard on the Venza Limited, along with a more powerful V-6 engine, all-wheel-drive, rear parking sensors, and HID headlights with automatic high-beam operation. A 181-horsepower, 2.7-liter 4-cylinder engine is standard for the Venza LE, paired with front-wheel or all-wheel drive. To get the 268-horsepower, 3.5-liter V-6 engine, add it as an option to the Venza XLE or upgrade to the Venza Limited, for which the more powerful motor is standard equipment, along with Active Torque Control AWD. All Venzas have a 6-speed automatic transmission, and all include two years or 25,000 miles of free scheduled maintenance. 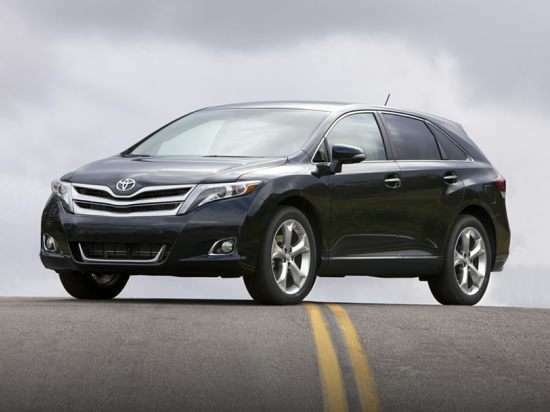 According to the EPA, the 2015 Venza is rated to return 23 mpg in combined driving with the 4-cylinder engine and FWD. Add AWD, or choose the V-6 engine and FWD, and the Venza’s rating is 22 mpg. Any Venza with the V-6 engine and AWD should provide 21 mpg. In crash tests, the NHTSA says the 2015 Venza delivers 5-star-rated overall occupant protection. The Insurance Institute for Highway Safety (IIHS) also thinks the Venza is safe, giving the crossover SUV a “Good” rating in all performed tests. Note, though, that the IIHS had not assessed the Venza for small overlap frontal-impact protection as this summary was written. Among the changes for 2015, Toyota has upgraded the Venza’s infotainment systems. The LE model features a 6.1-inch touchscreen infotainment display with HD Radio, HD traffic and weather information, a cache radio function, satellite radio, iTunes tagging capability, a reversing camera, a USB 2.0 port, and more. Upgrade to the XLE model for a navigation system, Doppler weather map overlap functionality, and Entune App Suite technology. Optional for the XLE and standard for the Limited is a JBL premium audio system with an upgraded navigation system.